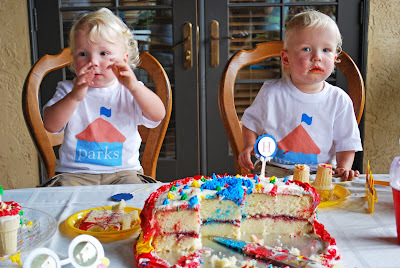 FINALLY....we have some pictures of Parks and Wyatt's second birthday. We (Randi and I) decided to go with a circus theme. We joked around that it best resembles our life over the last couple of years. We think the boys had a really fun time. There were a lot of kids there to share in the fun. I wanted to show off some of the good finds that Randi found on Etsy. 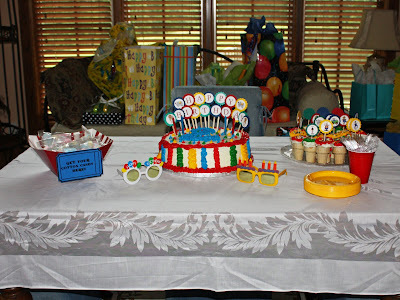 Here was the spread we had for birthday cake and fun extras that we had out for everyone. My sister made the cake for us and had it look like a big top. It was real yummy and took forever to get all that colored icing off the boys. Randi found the HAPPY BIRTHDAY letters on Etsy. 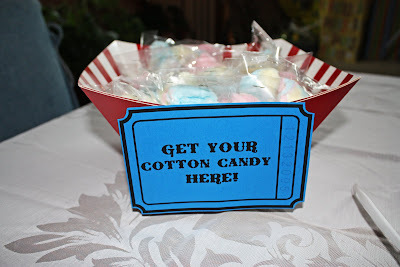 Randi and I put together the cotton candy packs for everyone and I used Photoshop and Word to create the ticket placards for multiple goodie stations. 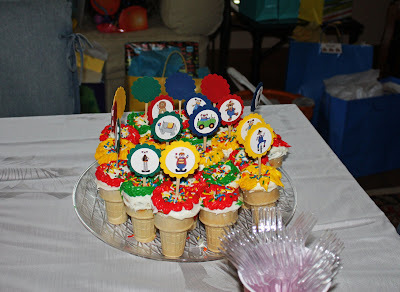 Randi made these cupcakes in ice cream cones and then frosted them. The fun little signs came from the same Etsy store. Here is a picture of the boys after devouring the birthday cake and ice cream cone cup cakes. They are wearing t-shirts that were silk screened from another friend of ours in Atlanta that also has an Etsy store. 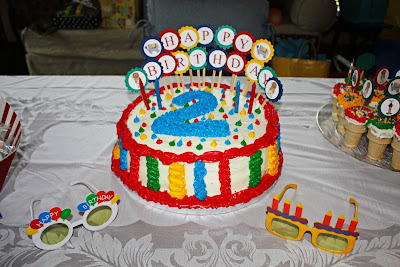 They also have a big numeral "2" on the back. We will start posting some more pictures of the whole day now that I have had time to edit them. The boys were wiped-out after a big day of fun and filling their bellies. I read the other post first...so I'll add Good job, Daddy & Aunt Kelly too! btw, Randi, I want the etsy store name of the silkscreener!